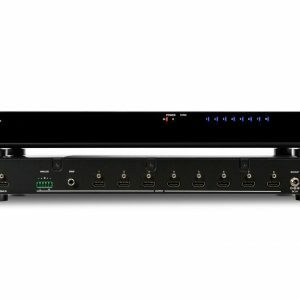 The Atlona AT-UHD-SW-52ED is a 5×1 4K/UHD HDMI switcher with HDMI and HDBaseT outputs, balanced analog audio outputs, automatic input selection and automatic display control capability. The switcher supports 4K/UHD @ 60 Hz with 4:2:0 color, offers 3D pass-through, and 10.2 Gbps bandwidth. In addition to an HDMI output, the switcher features a mirrored, Ethernet-enabled HDBaseT output. 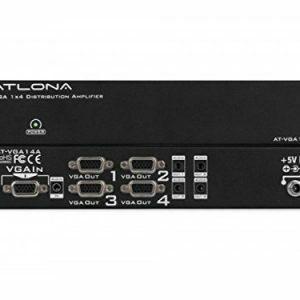 It transmits AV signals along with Ethernet, power, and control over a single cable to displays up to 330 feet (100 meters) from the switcher to PoE-powered HDBaseT receivers like the Atlona AT-UHD-EX-100CE-RX, HDBaseT displays, or even another switcher. Control options for the switcher include automatic input selection, front-panel buttons, and compatibility with IR, RS-232, or TCP/IP-based control systems. The SW-52ED provides control to a display through TCP/IP, RS-232, or CEC*, without the need for a separate control system. This simplifies system design and integration while reducing costs. 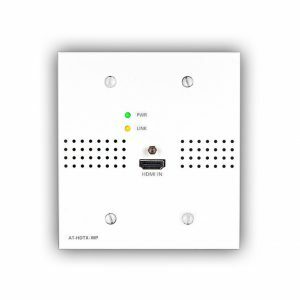 With automatic display control, the SW-52ED can trigger a display to power on automatically whenever a laptop or other device is connected, whether locally to the switcher or over HDBaseT. At the end of the presentation, when the presenter disconnects the laptop, the SW-52ED forces the display to power off. Ease of presenter interaction with the system, and the savings incurred by automatic display shutdown provide a significant return on investment. The SW-52ED’s display control capability can also be triggered by an external control system. A power button on the front panel can be used for manual on/off control of either the SW-52ED or the display. Front panel volume controls are also available to control the display’s internal audio, or another device with volume control, such as a DSP or another switcher. * Consumer Electronics Control (CEC): Atlona does not guarantee the function of CEC with all televisions. We can confirm proper operation with many current Samsung, Panasonic, and Sony TVs. Many manufacturers do not support the CEC “off” command when sent from a source and older TVs use proprietary commands. Atlona only supports those TVs that follow CEC command structure from HDMI 1.2a and support the “off” command when issued by a source. We encourage any dealer to get evaluation product from Atlona prior to designing a system around this control technology or be prepared to use other methods to control their displays if Atlona CEC is not compatible with the installed displays. The SW-52ED automatically selects an input source based on detection of the 5 volt hot plug detect (HPD) signal, as well as active video. 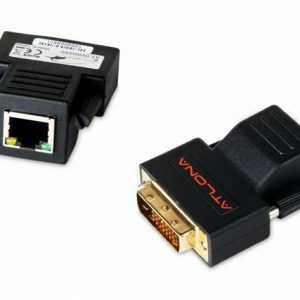 This ensures reliable auto-switching operation for all video sources, including DVRs, DisplayPort / Mini DisplayPort adapters, and other devices that always maintain the HPD line at the 5 volt “high” state but may not be delivering active video. The SW-52ED adds 4K/UHD performance and extended distance HDBaseT transmission to Atlona’s HDMI small switcher family for a unique solution for professional integration applications. Internal HDBaseT and video distribution eliminate the need for additional system components while PoE eliminates the need for a power supply for the receiver. As an alternative, with an HDBaseT-capable display, an HDBaseT receiver isn’t required, reducing system complexity and saving integrators time and money. Advanced features also include a web-based GUI for easy set-up and management of EDID, HDCP, and display control. The switcher offers audio de-embedding of PCM audio over HDMI to either S/PDIF or two-channel analog audio outputs. The switcher is a cost-effective product for professional integration featuring a compact, 1U, half-rack width enclosure that is easily installed with the included 19” rack mount brackets. Two units can be mounted side-by-side. Conference rooms and meeting rooms – The SW-52ED is compact and ideal for under-table mounting. It conveniently provides automatic switching and display control for simplified user operation, especially when laptops are brought into the system. Presentation spaces where two displays are needed – This switcher can be installed in a lectern to serve a confidence monitor, plus the primary display in a remote location. The Atlona Management System (AMS) is a powerful network software platform ideal for configuring, managing, and monitoring the SW-52ED and other Atlona IP-controllable devices over a LAN, WAN, or VPN. AMS is available free from Atlona, and greatly streamlines installation and maintenance of several Atlona products throughout a facility or enterprise, from a standard web browser.